The Commodores returned from fall break confident following their most recent win against Arkansas. The Dores knew they would have to keep that level of play and intensity against the likes of Delaware and Clemson if they wanted to complete a weekend sweep and push the team’s record to 9-2. 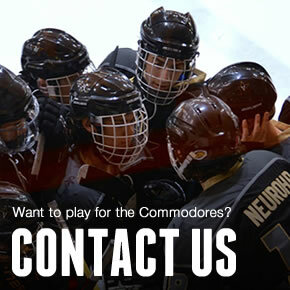 While the team’s best hockey was not on display over the two games, the Commodores managed to eek out wins against two tough opponents. Friday night the Dores took on a tough Delaware team, and while both teams took over half of the first period to settle in, the game turned into a shootout. Vanderbilt’s junior captain John Longman put the Commodores up midway through the first period with a goal on the power play. Delaware responded just five minutes later with a goal of their own, but Vanderbilt freshman Blake Beber took a long Bobby Mallon board pass for a breakaway soon after to put the Dores up 2-1 going into the second period. With the rust of fall break off, the second period was all business for the Commodores. Despite giving up two early goals to relinquish the lead, Vanderbilt managed to pile up three goals from Beber, Matt Murphy, and John Longman to take a more comfortable lead into the third. Down two goals, Delaware managed to give the Commodores a scare by scoring with seven minutes left, but junior forward Nick Honkala erased any doubt when he blasted a power play goal by the Delaware goaltender two minutes later. The 6-4 victory gave the Dores confidence going into a Sunday game against a tough Clemson team. Vanderbilt came ready to play Sunday morning against Clemson, and that showed over the course of the first two periods. Longman tallied a goal in the first with a rocket over the goalie’s shoulder off of the Brock Raffaele face-off win. Raffaele then went on to score in the second, deking two defenders and the goalie en route to the undoubtedly nicest goal of the season. The 2-0 lead after two periods had the Commodores in good position to win the game, but they needed a complete third period to do so. Raffaele was not done adding to the highlight reel. He topped his goal in the second period with another triple deke that dropped jaws on the bench. Nick Honkala then pounced on the Tigers for another goal just over a minute after. It seemed as though Clemson was going to bury their heads as the Dores kept scoring, but two quick goals from the Tigers gave them life in a 4-2 game. With just over a minute left, the Dores’ lead continued to slip as the Tigers scored a deflected goal to trim the lead to one. However, Longman had enough with the comeback and iced the game with an empty netter to cap off his four goal, and Vanderbilt’s two win, weekend. The Dores didn’t exactly make it pretty, but wins are wins. The team leaned heavily on junior goaltender Ryan Kellenberger to hold down the fort when the fall break rust seemed to leave Vanderbilt in a defensive haze. The team will be looking to ride their three game winning streak as they travel to play two games against in-state rival Tennessee on November 6th and 7th.